Call 310-539-2772 for more info. Dr. Miller is a seasoned psychotherapist with over 30 years of experience in private practice. He received a Postdoctoral Fellowship at L.A. County-USC Medical Center, specializing in adolescence and families. Later he was the Director of the Psychology Training Program at the Airport Marina Counseling Service for 20 years. My skills and philosophy of therapy have evolved over a broad range of training experiences, treatment settings, and working with a wide range of clients. I have a private practice in West Los Angeles and Torrance, specializing in the treatment of adolescents, adults, couples, and families, including premarital counseling. My philosophy of treatment is to work together with my clients to understand their particular needs, strengths, life ambitions and obstacles to progress. Often these obstacles relate to experiences, and the way they have learned to understand and react to others, which has affected their own self-image. After exploring how this relates to their struggles, we work together in developing a treatment plan to correct misconceptions and to help them better achieve the lives they are yearning for. I also adapt the length and intensity of therapy to my clients’ needs. For example, some clients are best served by clear and focused assistance in making meaningful changes, particularly those adjusting to an unexpected life crisis. For these clients, a brief pragmatic approach may best meet their needs. For clients with longstanding difficulties, or who are seeking deeper self-exploration and change, a more in-depth approach may be most helpful. Since sessions are generally 45-50 minutes once a week, I stress the importance of their actively thinking about what we discussed during the week and often give assignments. Regardless of the particular approach, I place sensitivity, empathy, and appreciation of clients’ strengths first. I appreciate that entering the therapeutic process involves courage and trust. Clients are opening up their lives, ambitions and fears to a complete stranger and in a manner to themselves that they may have never done before. Trust is critical and multi dimensioned. Trust that whatever is said is kept strictly confidential. Trust that the therapist will try his best to understand their unique past, struggles and capabilities, rather than perceiving everyone falling into categories. Trust that the therapist will empathize with their pain and choices they have made rather than judge them. Trust that the therapist will form a working partnership with them to overcome obstacles to growth, valuing their insights into their issues and providing his own. 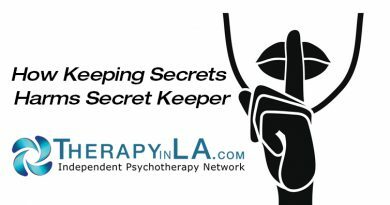 Trust that the therapist will use approaches that best fit their unique needs, be it in individual, couple or family therapy. Trust also includes that the therapist will only see clients within his areas of expertise. I understand the central role trust plays in therapy and dedicate myself to being worthy of that trust. Do We Worry Too Much as Parents? March 28, 2019 chrisjo Comments Off on Do We Worry Too Much as Parents? Copyright © 2019 Therapy in Los Angeles. All rights reserved.